Great to hear that the Axon 7 will get oreo! My top wishes are: stock android and: Camera2 api! It's a shame that a phone well-equipped like this one is limited so much because of this little detail. Thanks for your great suggestions! Each idea would be appreciated! They are forward to ZTE engineers and any new information I would let you know. Thanks for your suggestions! I would forward to ZTE engineers. Edited once, last by William Guo ( Jan 2nd 2018 ). @william-guo is there any estinated timeframe of what "just arround the corner" means? I have read something about april, but thats not what i would call "just arround the corner". I mean it takes what it takes and is no problem if we get regular security patches with not too big delays, just that we know what to expect. Oreo has an eta of April, that has been confirmed by ZTE Germany. Of course its nice to have the latest software but it needs time. I really hope that project treble will improve that situation in the future. Maybe they can at least still release security patches until April. Another issue I noticed on 2 Axons is that from time to time I cannot send and get whatsapp messages. I need to force stop the app and reopen in order to get it working again. I think it also happens in telegram, so I guess it's not just limited to whatsapp but maybe a general data usage issue which prevents apps to get online, maybe to save power. So please fix this, or if there already is a solution, let me know. Thanks. Edited once, last by daditunisien ( Jan 6th 2018 ). Battery improvement , its main problem . Also if it really I would like to get a radio , because SD820 has built-in radio modulе. 1. Camera 2 full mode API - as you've probably read almost everywhere here, is that we would like to have the full camera 2 API for this great phone to make the camera even better. 2. Faster and more accurate fingerprint reader- I can't speak for everyone here, but there are cases where I immediately unlock the phone using fingerprint, and other cases where I try and try, even changing fingers, where it just doesn't want to cooperate. Hoping you'd fix that. 3. Fingerprint gestures API - this is a cool nice-to-have feature, as it can become pretty reliable if implemented right. Things like swiping notification, home button or back can be mapped to different gestures. 4. Security patches - the last security patch for the German Axon 7 is from October. I understand how big updates can take time, but security patches van just be installed through OTA updates, so please keep that in mind. Monthly security updates would be really really great. 5. Faster double-tap-to-wake - again, speaking only for myself, even though I've read by A LOT of people, this feature is very slow. A faster implementation of this would be very nice since many people use it. 6. Power Manager - now this is a little controversial. I like the different modes of the power manager up until one point. Sometimes it gets too aggressive, which shouldn't be the case. And I found our that you can't apply any of these setting to apps that don't appear on the app drawer, which is kinda weird, because sometimes it's just an add on. Example: live wallpaper "app" I installed. Technically it's not an app since it just installs the live wallpapers to use with different apps and because of that, it doesn't appear on the drawer. Nevertheless, the manager cleans it after screen lock, making the wallpaper default back to the stock ones. 7. Live wallpapers - pretty self explanatory. 8. Album art - I've used a couple of different music apps and the album art provided by them doesn't appear on the lock screen, which I kind of got used to with previous phones. 9. Better translations - sometimes in the English setting, there are a couple of weird translations, probably from Chinese. So a better translation of them would be nice. 10. Bloatware - please remove everything people don't actually use. I hope I've been thorough enough with the features I think would be pretty amazing to have on this already great phone. I would also suggest a beta program. Providing some people with a beta version of Oreo so that you could get real time feedback would be a great project and I would even be the first one to jump on board. Thanks for listening/reading and hopefully I could've been of help. Thanks, William, for everything you've done so far regarding forwarding suggestions to the ZTE engineers. 12. Interactive quick settings - normally when you tap on a tile, you should get an interactive option right there. Example: tapping on Wi-Fi should open up a list of available Wi-Fis right there and then, and not turn the Wi-Fi off. This goes for the other settings as well. Also: when editing the quick settings, I would like to be able to delete some of them from there since I don't use them. 13. Screenshot - I like the screenshot functionality, resizing and scrolling downwards. Hopefully, you make it "prettier". Native support for screen recording, maybe by pressing volume up + power button would also be great. Or maybe a stand alone app, where you could choose to insert audio from speakers or not. Edited once, last by someoneelse ( Jan 11th 2018 ). Hi, thanks for your support and so good suggestions! I would transfer your voice to ZTE engineer, thanks again! 15) badge numbering for other apps, like viber, watsapp,..
William Guo can we have app icons in toast messages? Hi, sorry, I didn't get your means, are you saying that app icons in toast messages? I have no toast messages in phones, so could you make it more clearly? By its nature you can not know what app sends it. it displays the icon of the app it was sent by for identification. This makes it possible to identify apps that post error messages in toasts for example. There has recently been news that the A2017U has been getting an Oreo beta testing program. Do you know if there is going to be one for the A2017G as well? Sorry I cannot open this web that you offered in China, yet I get your idea. So you mean, when APP send new message or error message in the notification bar, there should have the APP icon at the same time. Am I right? Sorry, I have no accurate date on A2017G about update issues, but I will ask ZTE engineer. Thanks for the quick response. 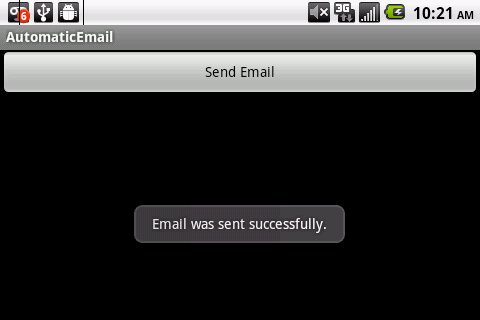 What FadeFX means are the messages that appear on the lower part of the screen for a short period of time. I'll add a picture of an example. In my opinion, the icon of the app needs to be a small icon in the upper right corner of the message. Also, I'd be very interested in what the engineers have to say about the beta program, so please keep us up to date regarding that. The trick is to post them as an image with the img tag or using the editor. Or if it's a Screenshot from you, you can just upload it here.